So your little one likes math activities and you want them to be fun? Hope these kindergarten color by number addition worksheets will do the trick! 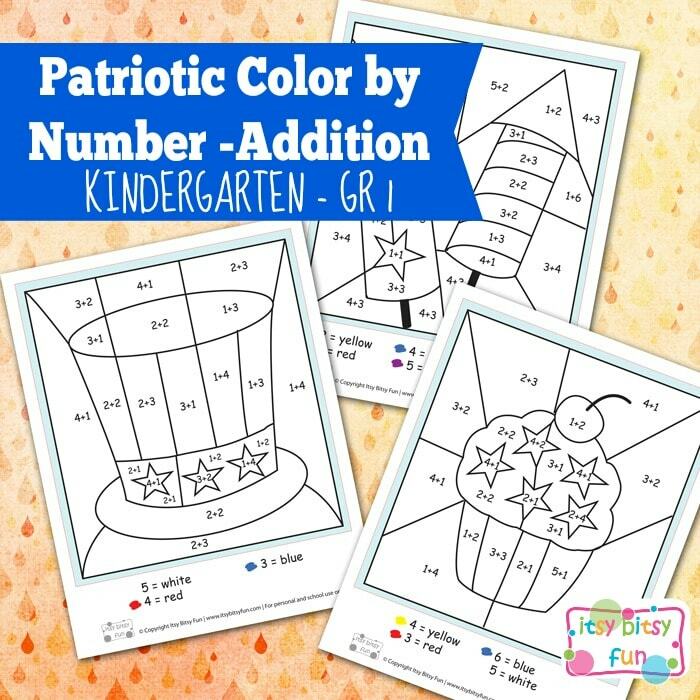 If addition is too much at the moment your kids can try the regular independence day color by number sheets. If your child is just starting out with addition I recommend doing hands on activities (everyday objects are always great) and to have them learn through play. Worksheets shouldn’t be used to teach addition. Now if your kid has a firm grasp on simple addition and needs a boredom buster while Independence day preparations are under way these are perfect! So! Let’s start the fun shall we? Perfect for home schooling parents or after school activities if kids like doing worksheets. I kept these pretty simple with not as many spaces to color (they do vary from page to page) so that kids won’t get bored and give up in the middle. But if they do, just let them – it is OK to not finish the worksheet, especially when it comes to ones that require solving math problems (especially with young kids). Get your free printable Kindergarten Color by Number Addition Worksheets here. Ready for subtraction? I’ve got kindergarten subtraction for kindergarten worksheets too!